This entry was posted on Sunday, August 17th, 2008 at 22:35 and is filed under Uncategorized. You can follow any responses to this entry through the RSS 2.0 feed. You can leave a response, or trackback from your own site. I’m wondering what the modification will be… First thing that comes to my mind would be a mod to be able to cut grooves under a certain angle, so you’ll be also able to create those type of blanks that the Easy Entrie cannot copy. Now thats a short manual! The machine looks great and will be exciting to see what you can churn out. I don’t believe they are adding additional functionality like undercut grooves Tom, just making it easier to use and reproduce the same results on future blanks. Hmm nice machine, although is copying restricted keyways a sure thing or a probability ? Nice blog by the way Barry. Looks like a lovely machine. Except for the electrics! The two holes the wires pass through are obviously meant to have strain-reliefs fitted. Adding those before any vibration chafes through the insulation on those wires would be my primary concern. Small angle vises are not very expensive and should do fine for undercuts. Oh sweet machine! 😛 Barry, do you plan to try to cut Abloy key profiles with it? It reminds me to the Pink Box (http://www.pink-box.de/). But I think your machine has a lot better price-performance ratio! Barry, how much for each blank? Are they made of clean brass or something beter? This machine is made in watayosi company, and it is a Japanese product. It is a very reliable machine spreading for a long time among the Japanese locksmiths. Looks like the cutters are sold individually by MBA so for those on a budget: a harbour freight mini-mill and right angle plate could probable be used to get the job done. 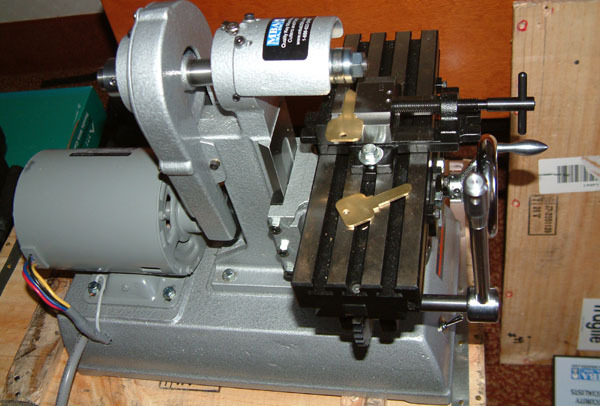 A lathe could also be used with some creative tool post work but to make that tool post would probably require a mill. There are after market z-axis tool posts which could be made to work if someone wanted. Entries (RSS) and Comments (RSS). 51 queries. 0.417 seconds.